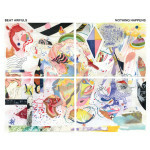 With a handful of self-released EPs and singles, Lexington, Kentucky’s four-track architects Beat Awfuls will release their proper debut LP, Nothing Happens, on 12 February. Featuring singer Dave “Cave” Vicini (guitar), Amanda Sue Witbeck (drums) and Dr. Paul (bass), the trio’s lead single, “You’re Not Gonna Love Me Anymore,” is an antitussive waltz, its melancholy bleached by sunlight. Having toured the US and Canada in the last year, Beat Awfuls will play a number of live dates beginning with two hometown record release shows. Full schedule below. Stream “You’re Not Gonna Love Me Anymore” below and pre-order Nothing Happens on limited edition vinyl via Jurassic Pop.